Founded on the Central Coast of New South Wales over thirty years ago, Bambi has long since helped Australian families sleep well under our southern skies, where the summers bake us dry and the winters bring fog and chill. This means a lot of interrupted sleep for us, so Bambi decided to do something about it. 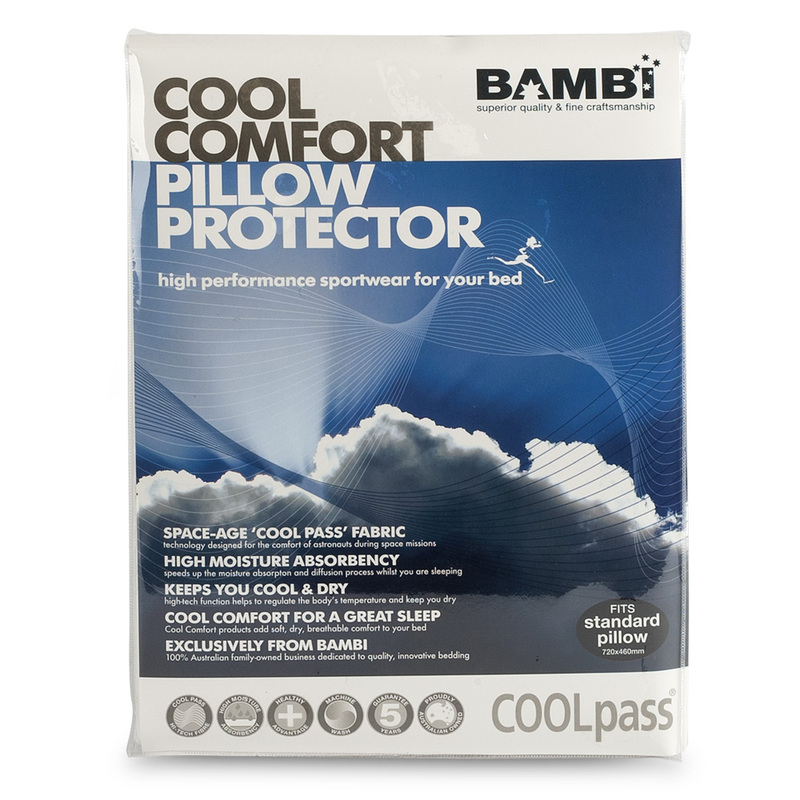 Bambi’s Cool Comfort Pillow Protector assists you in sleeping better in a number of ways, with focus on maintaining your body temperature and breathability as you sleep. And thanks to its Cool Pass high-tech fabric (the same material used to keep astronauts comfortable in outer space! ), you’ll not only be comfy, but you’ll be adding soft and breathable comfort to your bed. Thanks to its high moisture absorbency, the Cool Comfort Pillow Protector will keep you cool and dry all year round. The inner fibres are safe for those with allergies, and the entire thing can be popped in the washing machine in cleaning day. All of this means a better night’s sleep, giving you more energy in the morning. Pow! Made by a 100% Australian, family-owned business. Made from Cool-Pass - a highly advanced polyester material. Gives you the healthy advantage of keeping you cool and dry as you sleep, regulating the body’s temperature. Dimensions: 72cm (l) x 46cm (w).